As far as fabrics go, almost nothing appeals quite as plush as velvet. From a slinky evening look to a sophisticated work vibe, velvet hits the mark every time. Considered to be a season specific cloth, it is adorned beyond the cooler months. That’s why it continues to capture hearts of fashionistas around the globe. From USA’s top model Kendall Jenner to London’s fashion icon Victoria Beckham; everyone seems to be in a love affair with velvet. We couldn’t be more excited to welcome this 90’s trend back and that too just in time for fall. 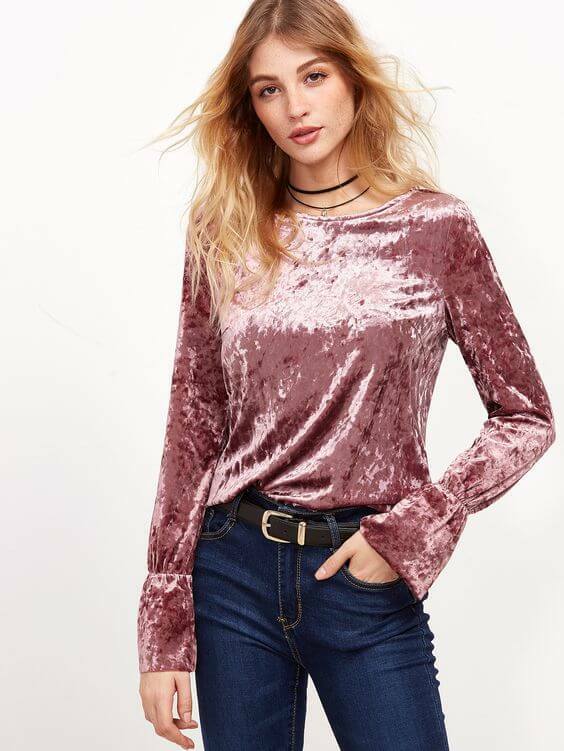 With velvet tops, the mantra is to avoid anything too snug or short — unless you’re layering it with a jacket or a coat. Let the soft drapes and the shimmering surface of velvet highlight the show. The simple yet pretty silhouette will talk for itself. This top by Cover Story in hues of pink describes what the hubbub is all about. The shoulder straps form a stylized V-neck to call attention to your slim neck. Go online shopping for kitten heels in tints of rose gold to complete the look. Ditch the notion that velvet is seasonal. From slip to t-shirt dresses, the new, revamped collection of velvet dresses look great with sneakers to pumps and everything in between. Don these through the early days of fall – we’re sure they will be the pinnacle of the season. This wine colored bodycon dress by Cover Story is the perfect pick to flaunt a captivating appearance. Decked with cut out detailing on the front neckline, this sleeveless dress is soft on the skin. Team it up with a pair of strappy stilettos and all eyes will be on you. Knowing the kind of velvet dress that complements your shape can do wonders for you. A ruched dress, for that matter, suits a fuller and petite figure alike. If you’re the latter, ensure that the dress is ruched around the waist or the chest. Classic black stilettos with this ruched detailed velvet dress from Cover Story make it the perfect ensemble for official parties. Pair denims with velvet dress shirts or tunic-length blouses to look exemplary this fall. Sport a satin blouse with a velvet skirt and knee high boots. Reach for this go-to fabric in a solid color and figure-hugging silhouette to glam up for any party. Go hipster with flared velvet bottoms and a silky or lace blouse in neutrals and add a splash of color with your accessories or a big tote bag.